Kouremenos Beach is located 1.5km from the village of Palekastro and 19km from the Town of Sitia. The beach is 1.5km long and its white sand and crystal clear waters, with tamarisk trees lining up the coast make it one of the most beautiful beaches in Crete. The water is warm, about 24 degrees Celsius between June - August, and the outside temperature ranges from 30-35 degrees Celsius. Wetsuit is not needed, just a rash guard with UV protection to avoid sunburns. The Meltemi wind is accelerated by the thermal effect of the hot summer which increases it by 2 Beaufort meaning the wind here is usually stronger than anywhere else in Crete! The wind direcion is side shore from the left and the average wind strength is 4 to 7 beaufort. The bay offers perfect flat-water conditions near the shore and ideal location to practise gybes and freestyle moves on the small waves found on the outside. 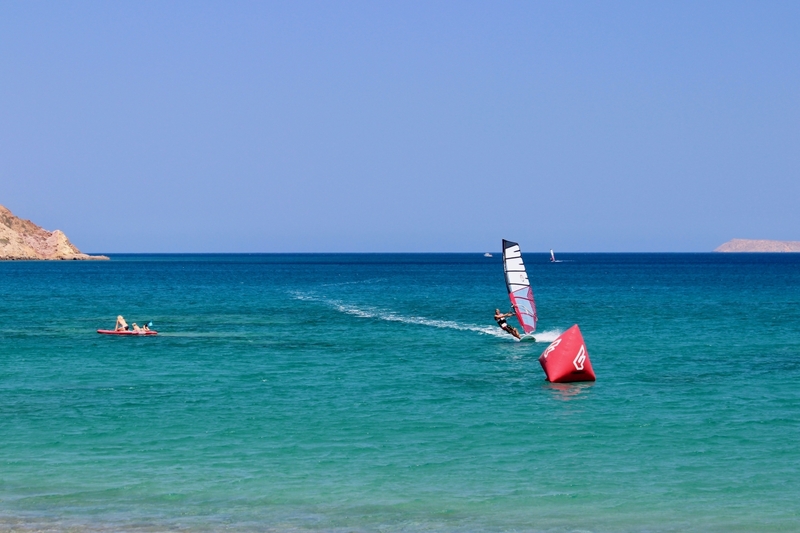 Right on the beach you can find GONE SURFING CENTER where you can rent top end windsurf equipment for all levels. Also beginners lessons are given from experienced instructors.